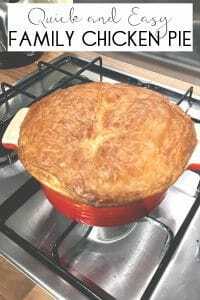 Simple recipe for chicken pie that is perfect for mid-week family dinners. Quick to put together and tastes delicious served with vegetables and potatoes. In a pan heat the butter and oil together until melted. Add in your chicken breasts, mushrooms, onions, garlic and stir until they start to colour. Add in the flour and mix together well. Pour in the chicken stock and stir. Season with the herbs and salt and pepper to your taste. Add the frozen peas and heat thoroughly for around 5 minutes. Pour the chicken into a pie dish. Cover and bend over with the puff pastry to seal. Put a few holes in the centre of the pie to allow the steam to escape. Place in the centre of the oven for around 20 minutes until the pastry is golden and puffed up. Serve with potatoes and vegetables which can be cooked whilst the pie is cooking.